Is There Such a Thing as Good Instant Coffee? Here’s your daily digit: Everyday, more than 2.25 billion cups of coffee are consumed around the globe. That’s a lot of java, and I certainly contribute to that number everyday. Even when I’m in the deepest corners of the backcountry, a warm cup of Joe is really the only way to start the day. On my trips supported by a vehicle it’s not a big deal to break out the French press, but for uber-light trips I don’t always have room for such luxuries. This has lead me on a quest for the best instant coffee available. Just hearing the words instant coffee is enough to make my neck hairs bristle as most instant coffees are in a word––awful. At any rate, there are some instants to keep on your radar. Starbucks launched their Via coffee line in 2009 to a sizable amount of push-back. Few wanted to believe it could measure up to the company’s properly brewed coffee, which I personally think is average at best. 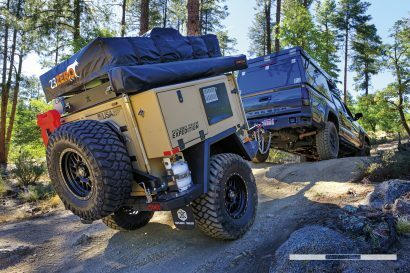 At any rate, Via is a high-tech combination of freeze dried and “micro-ground” coffee. In short, the dried coffee provides the bulk of the coffee volume and the micro-ground coffee bolsters the flavor. How does it taste? All things considered, as good as Starbucks coffee gets, which is impressive considering it’s instant coffee. The package is also miniscule. A week’s worth of VIA can fit in your closed hand. 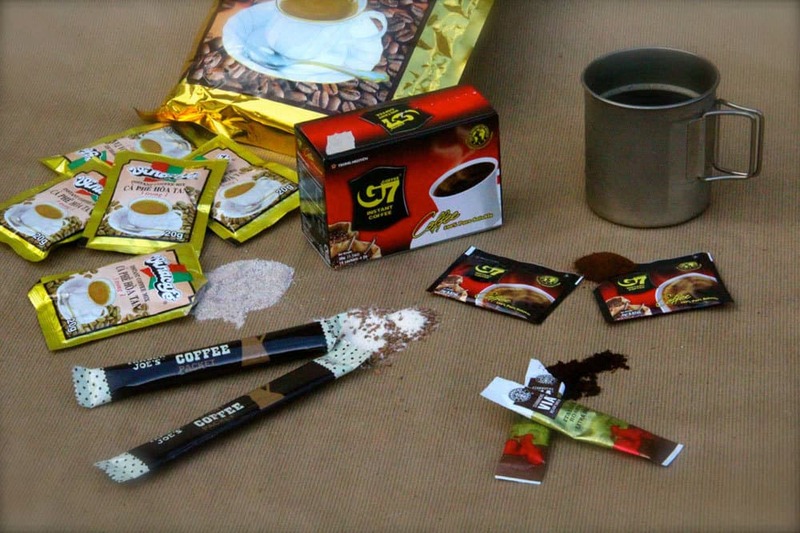 South Korea, Vietnam, and other Asian nations have an affinity for instant coffee, especially those instants already doctored with cream and sugar. In an effort to mimic that coffee, Trader Joe’s offers their own house-brand instant coffee. I’ll spare you the suspense, it wrestles Taster’s Choice for the coffee most foul. Chalky and weak, it’s more of a suggestion of coffee than the real deal. It really is terrible unless you want a powdered milk latte. 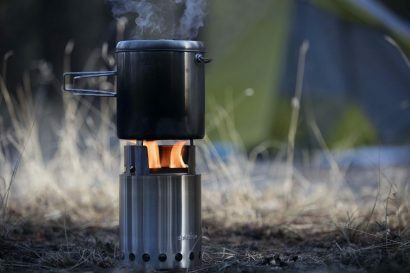 I tortured a number of campmates with this coffee before deciding it deserved a thumbs down. Only one of our testers could stomach a second cup, but we’ve had other people tell us they like it. I guess you just have to try this one to find out. It is pretty cheap. There are a number of Asian manufacturers locked in a death match for the title of “Best Instant Coffee.” If I had to pick a favorite, it might be the curiously named G7 coffee from Vietnam. 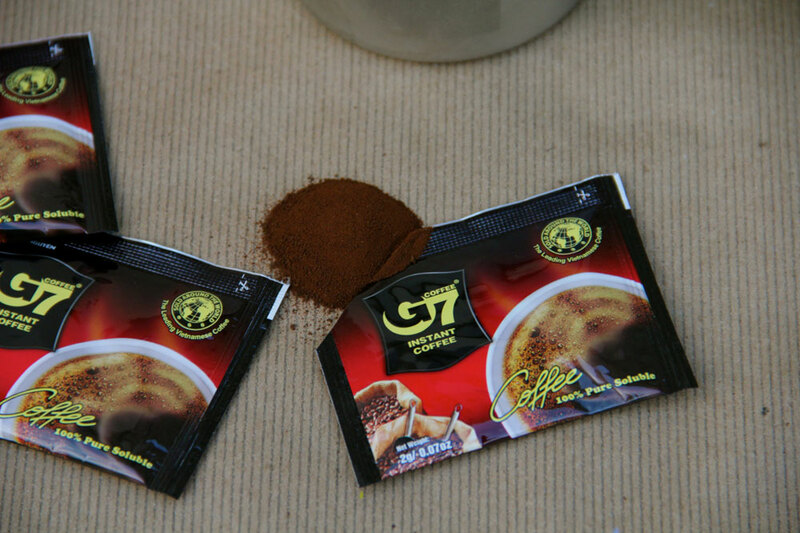 Said to be Southeast Asia’s favorite instant coffee (by G7 themselves) this coffee is never freeze dried or concentrated. They’re quick to point out that this coffee is produced in a ten million dollar facility, so perhaps that’s the secret. I wonder if it’s the added maltodextrin that gives it a rich viscosity, just as it does in good beer. The amazing thing about G7 is how little coffee they fit in the micro-packet. Probably too little, as I found I needed about two packets per eight ounces of water. The very fine powder dissolves instantly and provides a quality of flavor I might say trumps the Starbucks Via coffees. Their 3-in-1 coffee is the best 3-in-1 in my opinion. G7 mixes up with a really impressive crema, although it fades rapidly. 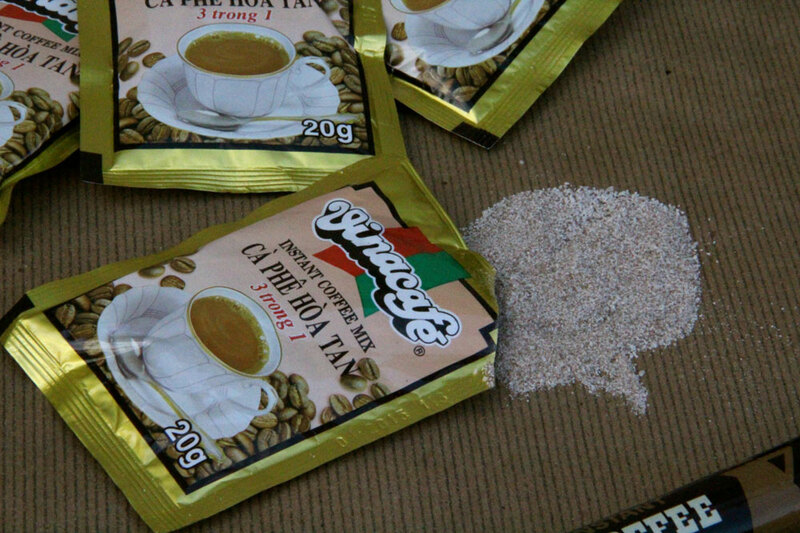 Another Vietnamese product, Vinacafe, is said to be a French style coffee. I guarantee that claim makes the average Frenchman’s head explode, but we’ll just consider that cheeky marketing. Vinacafe is freeze dried much like most other instants, but they did a nice job of it. Again, for those who like cream and sugar, they struck a nice balance with those flavorings. It has a nuttiness that I found added to the complexity of the overall flavor. Like the three coffees above, this coffee is also packaged in neat little individual servings. If I can’t find G7, I usually look for Vinacafe. 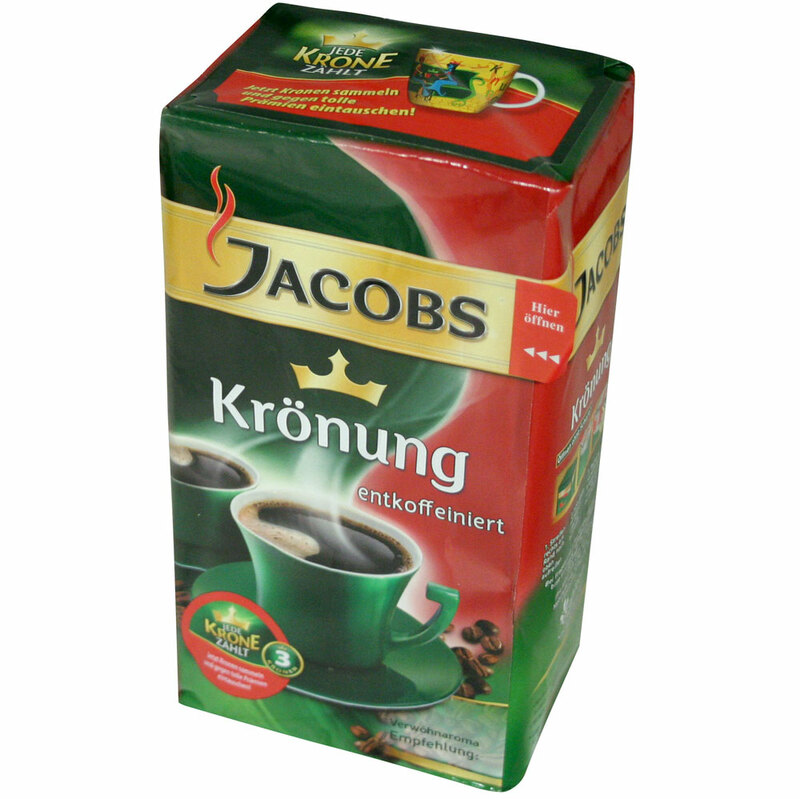 Jacobs suffers from a rare but refreshing affliction––truth in advertising. They claim their instant coffee is almost as good as fresh-brewed. This is freeze dried coffee, so it’s tough to expect too much from it. File it along side Sanka, Folger’s and their ilk. It’s got a reasonably rich flavor, although I’m not sure I like it. As instants go, I do think it’s better than most. For those not wanting a 3-in-1 instant, I’d give it a go. It is only packaged in a bulk container, which is a consideration for those looking for a convenient, lightweight travel coffee. After testing enough instants to nearly rot my gut, and sour my love of coffee, I have come to learn almost all freeze dried coffees taste relatively similar. The flavor profiles may have subtle differences, but they all taste hopelessly manufactured and manipulated. In that regard, I do think the best instant is the Starbucks VIA with G7 almost as good. The 3-in-1 instants with cream and sugar are nice because those additional flavorings can hide some of the weaknesses with the coffee flavor itself. 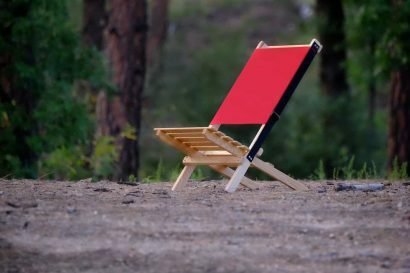 There are ample options, and these five instants only scratch the surface. 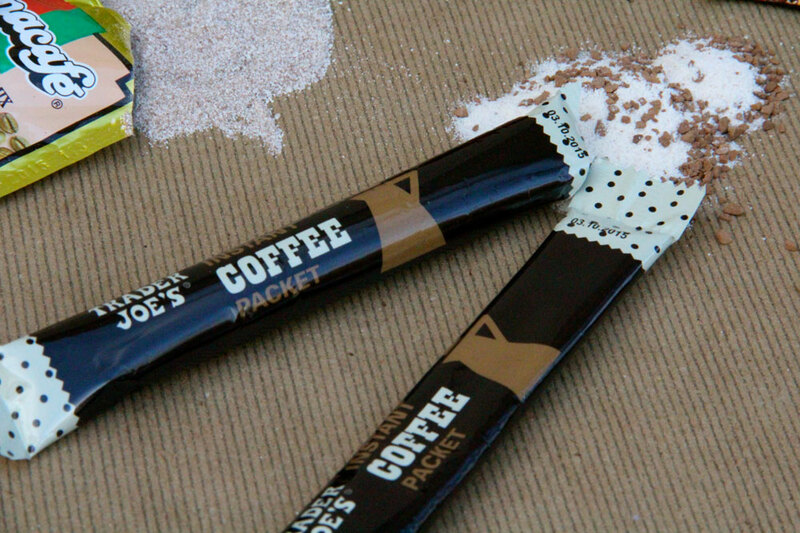 Instant coffee doesn’t have to be cringe-worthy. There are palatable options to be found If you can’t justify packing the entire kit to make a proper brew. Most of these can be found on Amazon.com if you can’t find them locally.